This article provides instructions to configure and register Universal Windows Platform based devices with the Appspace App. The table below lists the minimum system requirements of the desktop PC or notebook to run Appspace App. It is highly advisable for you to ensure any chosen device will fit seamlessly into your environment, and meet the needs of your specific use case. Please test your UWP devices with the Appspace App before you choose to deploy to your production environment. Do contact us for any questions and we’ll be happy to make some introductions. We recommend using Windows 10 version 1803 (OS build 17134.112) or higher. If the same Windows image is being deployed to multiple devices, it is best to install Appspace App after the image has been deployed. Deploying an image with Appspace App installed will cause conflicts, and registrations issues. Follow the instructions below to download and install the Appspace App. Launch the Windows Store from your device, and search for Appspace App. Select the Appspace App, and click the Get button. Once installed, the Appspace App is visible in Windows. Click the Appspace App icon to launch the app. Once in tablet mode, click on the Appspace App icon to launch the app. Once Appspace App is launched, register your device. We recommend creating one account in the UWP device that will be used specifically for the Kiosk mode configuration. We will call this the Kiosk account. Log out, and log in to the UWP device using the Kiosk account credentials. Log out, and log in to the UWP device using the UWP Administrator credentials. 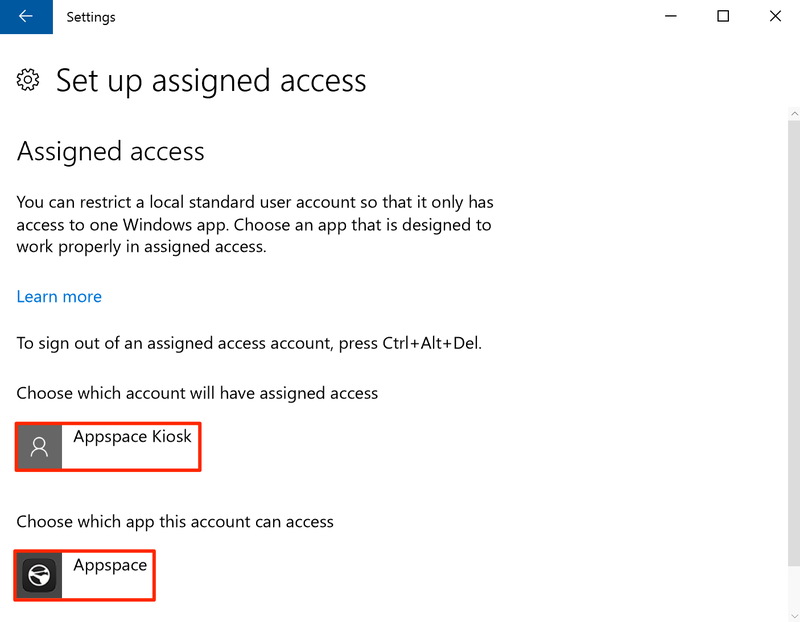 Select the kiosk account, and Appspace App when selecting an account and app for Assigned access. Once the kiosk configuration is complete, log out and login using the Kiosk account credentials. The Appspace App will launch automatically. 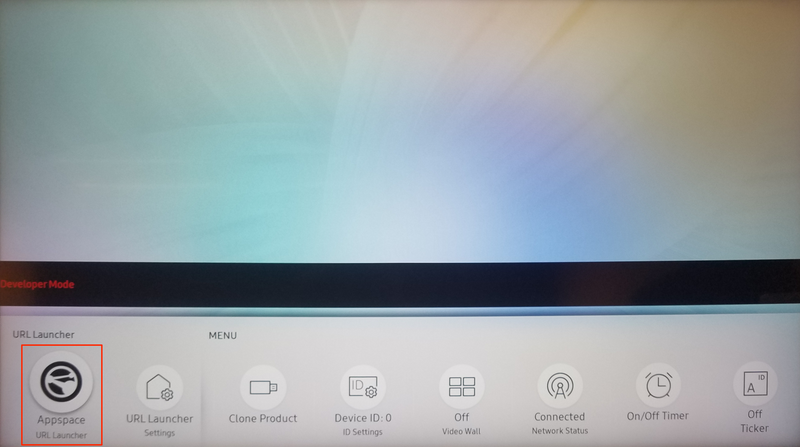 To access the Device menu in Kiosk mode, press Alt + Tab, or touch the screen first to ensure the Appspace App is active. Next press Ctrl + Alt + M to bring up the Device menu. You may install the App using this method if you are unable to download the App from the Windows Store. 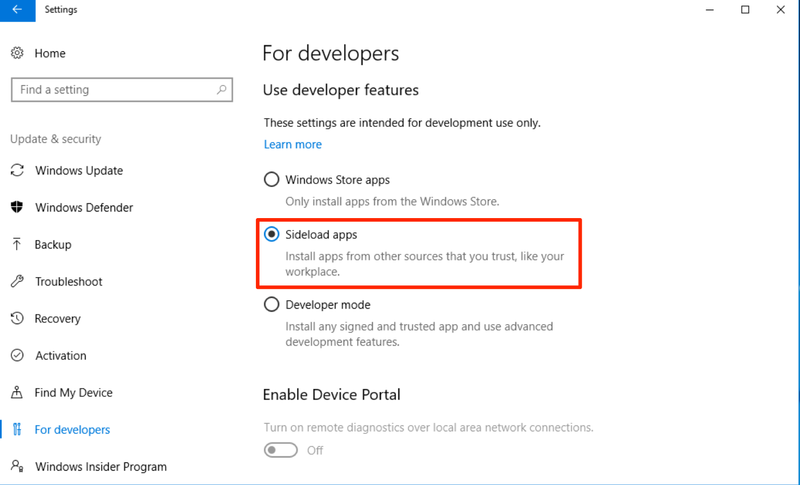 The Sideload app developer option must be enabled. The App Installer from Windows Store must be installed. Follow the instructions below to download, and install the Appspace App. Navigate to System > Downloads, and download the Appspace App for UWP client (win10uwp-files-prod.zip) to your device. Once downloaded, extract the win10uwp-files-prod.zip file. Double-click the Appspace.App.Windows10_1.18.0.0_x86_x64_ARM.appxbundle file, and click Install. Once installation is complete, launch Appspace App via the Windows menu. The Developer mode developer option must be enabled. 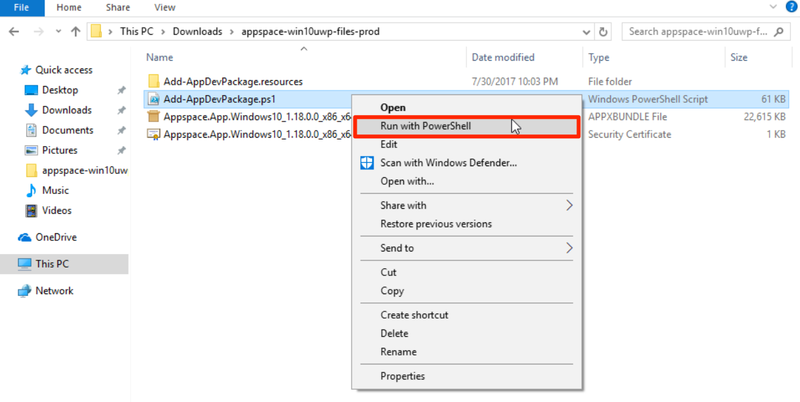 Right-click the Add-AppDevPackage.ps1 file, and select Run with PowerShell. Once installation is complete, switch back to Sideload apps mode. Launch Appspace App via the Windows menu. 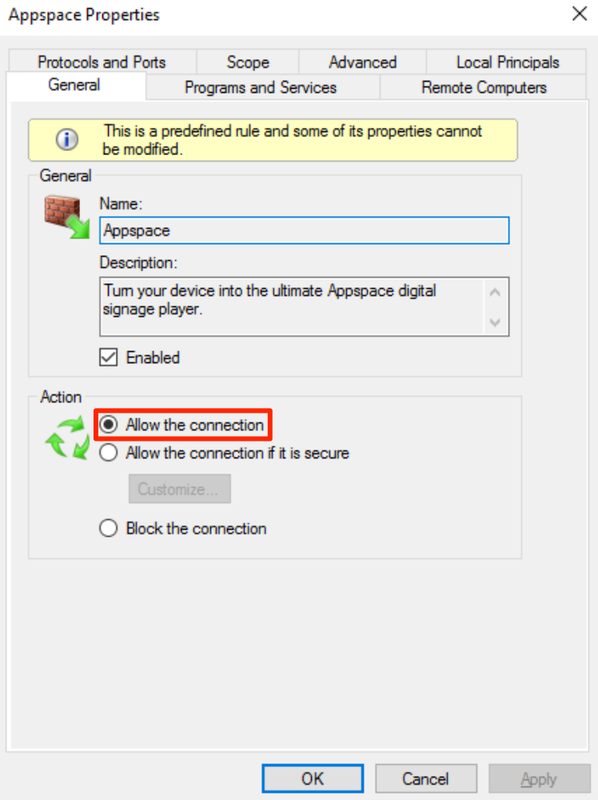 If the Appspace App is unable to register your desktop PC or notebook, your firewall may be blocking outbound connections of the Appspace App. Launch the Windows Firewall from the Windows Control Panel. Select Outbound Rules on the left. 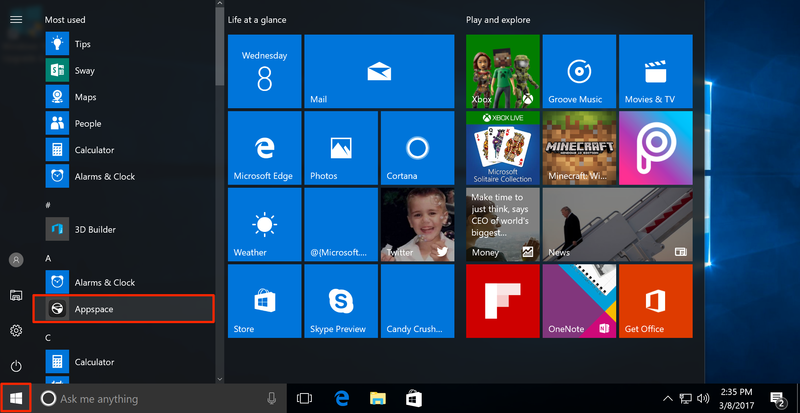 You should be able to see a list of installed Windows Apps. Right-click Appspace from the list and select Properties. In the Appspace Properties window, select the General tab. Select Allow the connection in the Action section, and click OK.
To uninstall Appspace App from a device, follow the instructions in the following Repair or remove programs article: https://support.microsoft.com/en-us/instantanswers/ce7ba88b-4e95-4354-b807-35732db36c4d/repair-or-remove-programs.